Now that monitor makers have woken up from their slumber (remember when the top monitor was a 30-inch 2560x1600 IPS display? ), you can afford to be picky. And you should be—between the near constant arrival of new models and price cuts on existing ones, you shouldn't feel like you settled or overpaid. 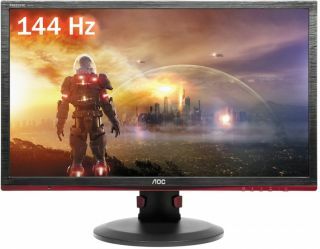 With that in mind, AOC's 24-inch G2460PF monitor is currently on sale for $210 from Amazon. There are no mail-in-rebates or coupon codes, just a straight up discount on a fast 24-inch monitor. This one uses a TN panel with a 1920x1080 resolution with a 144Hz refresh rate and 1ms response time. It also features FreeSync support. Other bullet points include 350 nits brightness, 80,000,000:1 dynamic contrast ratio, built-in speakers, and connectivity consisting of VGA, DVI, HDMI with MHL, DisplayPort, and four USB 2.0 port. On the ergonomics side, the G2460PF's stand supports pivot, swivel (-165 to 165 degrees), tilt (-5 to 22 degrees), and height (130mm) adjustments. This is not the best bargain we've ever seen on a monitor, though it's decent enough to warrant a heads up. If you're interested, go here.